Jackie Robinson West will play for the Little League World Series U.S. title on Saturday against Las Vegas. CHICAGO — Jackie Robinson West coach Darold Butler is convinced his team will win the Little League World Series United States title on Saturday in a rematch against Las Vegas. "I feel a win, honestly," Butler told DNAinfo Chicago on Friday. "Vegas hasn't lost yet, and I feel they're going to come in relaxed and think they have a cakewalk against us and not realize the game is over until it's too late. They're not going to know what hits them until it's over." The U.S. Championship game is 2:30 p.m. Saturday on ABC7 at historic Lamade Stadium in South Williamsport, Pennsylvania. The city will host watch parties for the game on the Far South Side party, at the Kroc Center, 1250 W. 119th St. Mayor Rahm Emanuel plans to attend. A Downtown watch party will take place on State Street in front of the Chicago Theater between Randolph and Lake streets. State Street will be closed between Randolph and Lake streets beginning at 12:30 p.m. until shortly after the game ends. 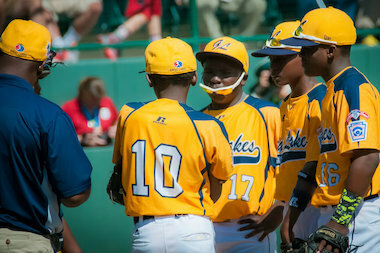 Jackie Robinson West is hoping to join North Roseland's 1967 squad as the only Chicago team to claim a Little League World Series U.S. title. If Jackie Robinson West prevails Saturday, it will vie for the world championship Sunday against either Tokyo or South Korea. To do that, the Morgan Park-based squad will have to defeat the only team that's defeated it in postseason play. Las Vegas crushed Jackie Robinson West 13-2 in four innings on Sunday. "It won't be the same result," Butler said. "Both teams are battle-tested, prideful. Honestly, in my heart, I can't see them beating us twice." Las Vegas has rolled in all three of its series games to reach the U.S. championship, while Jackie Robinson West has had to win three elimination games — including Thursday's nail-biting, 6-5 victory over Philadelphia — just to reach Saturday's contest. "It's unreal to be one of the last two teams standing, but it's nothing we ever doubted," Butler said. "The games have been getting closer with more adversity and more challenges, but the kids are still finding ways to get it done." Congratulations to Chicago’s Jackie Robinson West for reaching the U.S. #LLWS2014 finals! 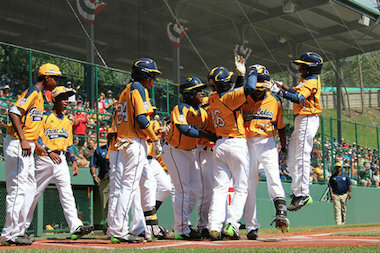 Jackie Robinson West players celebrate at home plate during the Little League World Series. Butler said Joshua Houston "probably" will be Jackie Robinson West's starting pitcher Saturday. On Friday, the city announced it would host a homecoming parade for the team Wednesday. Details will be released next week.